With advances in cancer immunotherapy splashing across headlines, the immune system's powerful cancer assassins—T cells—have become dinner-table conversation. But hiding in plain sight behind that "T" is the organ from which they get their name and learn their craft: the thymus. A new study published Friday in Science Immunology identifies a molecule called BMP4 that plays a key role in the thymus's extraordinary natural ability to recover from damage. In this video, Dr. Jarrod Dudakov of Fred Hutchinson Cancer Research Center, one of the study's leaders, talks about the importance of the thymus, the discoveries he and his colleagues have made about how it regenerates, and the team's next steps. The researchers hope to translate their work into new therapies to improve the function of the immune system in old age and make immunotherapies more effective. 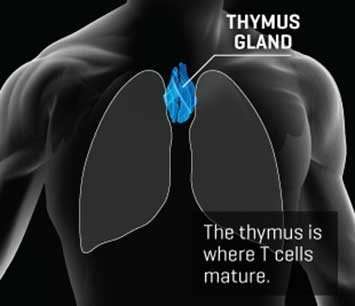 The thymus is like a boot camp for new recruits to the immune system. From their birthplace in the bone marrow, immature white blood cells go to the thymus to mature into disease-killing machines. A healthy, active thymus gets you a diverse set of different T cells, each equipped to recognize and kill a slightly different foreign target. Thus, the organ is critical for a strong immune system that's ready to defend you from any threat. Although the thymus is sensitive to damage from everything from infections to life stress, it is also naturally resilient. Its power to bounce back from injury, however, fades with age, and it can take a serious hit from certain aggressive cancer therapies. What if we could harness the thymus's natural regenerative power to speed its recovery from serious injury, help it stay active with age, and make immune-harnessing drugs work better to fight cancers or infections? BMP4, the molecule identified in the team's new study, is only the second known driver of natural thymic regeneration. (The first one, called IL22, was discovered by the same research team in 2012.) The researchers found that BMP4 is produced by certain cells lining the inside of the organ. That molecule signals other cells of the thymus to turn on genes that promote development and repair. Now, the team is working to figure out whether there's a master trigger that activates the whole regeneration process—and then translate that knowledge into new therapies that help patients. "The thymus is really a bit of a forgotten organ," Dudakov said. "Everyone works on T cells, but not many care about where they come from. But we would argue that it's pretty important." Can we turn back the clock on an aging thymus?